Located on the holy Nilachala Hills, the Kamakhya Temples’ Complex of Assam is one of the world’s most important sites of goddess worship, and is literally and figuratively the birthplace of modern Shaktism. Sri Sri Kamakhya Temple (or Peetha of Sri Sri Kamakhya). Adjacent to the Peetha of Sri Sri Kamakhya the Peethas of other two peethas of the Dasamahavidyas, Sri Sri Matangi (Saraswati) and Sri Sri Kamala (Lakshmi) are also located. 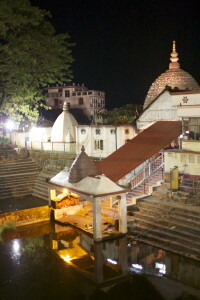 Sri Sri Kamakhya is the form of Sri Sri Tripurasundari or Sri Sri Sodasi, the third Mahavidya of the Dasamahavidyas.